— Submitted photo Lisa Schaa, Taylor Wilmoth, Justine Trueblood and Sara Trueblood hold their signs during the Women’s March in Washington, D.C. Jan. 21. The four women traveled to the nation’s capital to march with thousands of others in support of human rights issues. 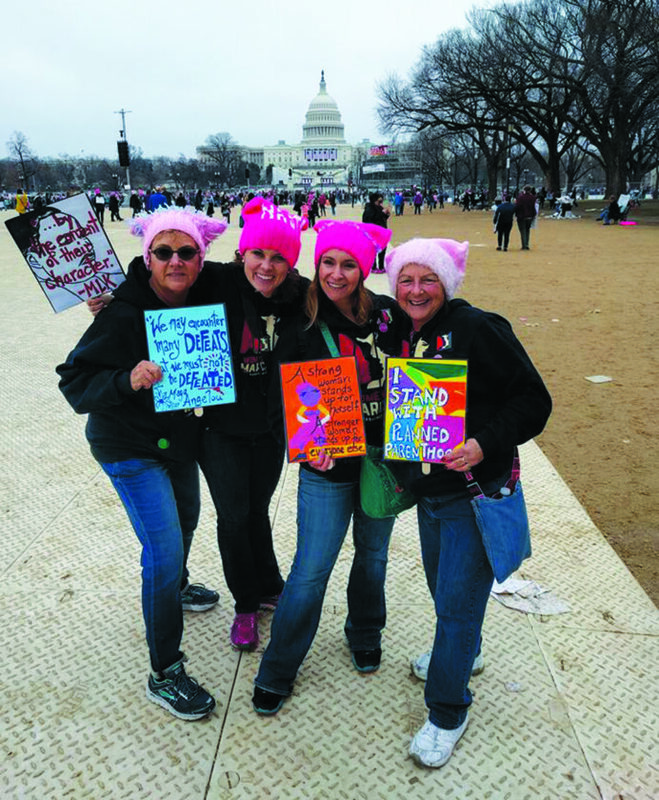 Last Saturday, two Webster City women and their adult daughters were among the estimated half-million people who traveled to Washington, D.C. to be part of the Women’s March. Lisa Schaa and Sara Trueblood were joined the thousands of people who marched in support human rights issues that they feel are threatened by proposed policy changes from the new administration and Legislature. Schaa said she first saw the announcement of the march on Facebook. Though interested, she couldn’t find anyone else who planned to attend. “They said they couldn’t take the time off,” she said, adding that she sort of discounted the idea from there. But she ran into Trueblood at the grocery store and asked her what she thought about the march. Trueblood hadn’t heard about the event. But she did some online research to learn more. “I looked it up and read about and then I texted Lisa and said, ‘I’m in. Let’s go,'” Trueblood said. The two women went online to figure out the logistics of the trip. Rally buses were organizing all over the Midwest, including one leaving from Des Moines. They then decided to see if their two eldest daughters, Taylor Wilmoth and Justine Trueblood — classmates from Webster City High School — would be interested in going also. Taylor lives in Wisconsin and Justine travels extensively for work. “We knew it was a long shot. I didn’t know if Taylor could get the time off and we didn’t know where Justine would be at the time,” Schaa said. But the two daughters were excited about the march and ready to make the trip to Washington. “In the meantime, the buses were rapidly filling up,” Trueblood said. Schaa said received a panicked call from her daughter who said that the buses from Des Moines were filled as were the buses from Madison, Wisconsin and Peoria, Illinois. They eventually found seats on a rally bus in Deerfield, Illinois. The two moms drove more than five hours from Webster City and Schaa’s daughter drove from Madison to meet them at the bus. Trueblood’s daughter was in North Carolina and found a bus originating in Christiansburg, Virginia. In preparation for the trip, Trueblood knitted four pink caps for her group to wear. The iconic hats became a symbol of the march and the movement that it created. “I tried to make all them unique and different,” she said. Many of the other marchers had the same idea, as photos from the day show a sea of pink stretching from one end of the route to the other. Schaa said the trip was 36-plus hours of driving and riding a bus within a 48-hour time span. That meant they were actually at the march for just 8 hours. The women slept on the bus and arrived in Washington rested and ready to march. The term “marching” might have been deceiving. With the larger than expected crowd, the participants were packed into the streets and only moved inches at a time. “I told somebody when I got back that I didn’t even get my steps in for the day,” Schaa said. The women had a cell phone app from the Women’s March that was supposed to give them updates on the crowd, where things were moving and other news. But due to the spotty cell phone signal, none of those notices came through. They later learned that the march route was jammed from end to end with all of the people attending. The four women walked over to the National Mall, where there were fewer people. “We were all talking about being bummed we couldn’t actually march, but then we looked around and saw people moving,” Schaa said. On Pennsylvania Avenue, the women joined a crowd that moved several blocks. With their handmade signs and their pink caps, they marched and chanted along with women and men from all over the country. “The march was peaceful, colorful …” Trueblood said. “And there were so many different ages all coming together,” said Trueblood. They encountered no riots, no fights. The police along the route were respectful and kind, Trueblood said. During the bus trip, Schaa said one of her friends posed a question to her on Facebook — what she was protesting? She shared the comment with people on the bus. “What I told my friend was I wasn’t protesting. I was standing in solidarity. And everybody on the bus was shouting out ‘… for minorities, for people with disabilities, for women’s rights, for human rights …’ and I kept adding all of this to my Facebook comment to him,” she said. According to Schaa, the march wasn’t about protesting President Donald Trump. It was about standing up for people in solidarity. “I guess I want the administration to know that there are people out here who want to be heard,” Trueblood said. One of her greatest concerns is for those who have no health care or who may lose their health care with the dismantling of the Affordable Care Act. “We have these rights and we don’t want them to go away. We’ve come this far and we’re not going backwards,” she said. Schaa said as the preparations were proceeding for the trip, she told her daughter that if arrangements for travel to D.C. couldn’t be made, she and Trueblood would just go to the rally in Des Moines and that she could attend the Madison rally. “Taylor said, ‘That is not an option.’ She was adamant. I think she and Justine were even more determined to go than we were,” Schaa said. When a bus breakdown in Chicago threatened to delay or prevent their progress, the two moms suggested that maybe they could march at the Chicago rally. “I actually feel more hopeful because these two young women were so passionate about making this trip,” she said. The Washington March and those all across the country and around the world brought together what some are estimating to be 3 million people. Some marches numbered in the tens of thousands, others had just a handful of people. Regardless of the number, the two women said the marches were not just a moment in time, but the start of a movement. Trueblood said educating the public about of human rights, women’s rights and other social issues is key to achieving the goals. She said volunteering for organizations is also important. “I think that it takes something like this (march) to get people back together and fired up,” Schaa added. The marchers came back with a list of 10 things to do in 100 days. “We’ve actually started a grassroots effort here — the Women’s March Webster City. We have a Facebook group and we’re moving forward,” Schaa said. People interested in joining can send a request to the Facebook group. The local volunteers are planning meet this Sunday at 2 p.m. at Shanti Wellness Day Spa to write postcards to the Legislators, the first of the 10 actions. All who wish to help are invited to attend, according to the organizers.